Have you checked out EdenCafe lately? 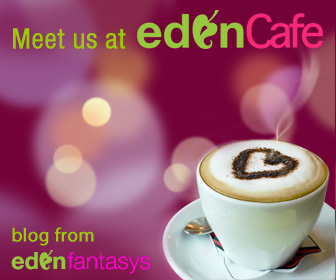 Eden Cafe is the blog brought to you by EdenFantasys. Eden Cafe has many authors, many topics, and many giveaways going on all the time. It's a great place to ask a question or discuss something you might not normally want to discuss. It's a great place to sit back and learn, or participate in many of the fun contests and giveaways & maybe get to try something you'd never though of trying before. At Eden Cafe, each author is entitled to their own opinion and view point, just as each reader is. The atmosphere is respectful of that and if you see a topic or opinion that just isn't for you, check out a new topic, as there is always something going on over there. Eden Cafe kind of ties together all that EdenFantasys does - the blogging & reviewing community, articles, polls, new product spotlights, news & reviews - done for the community, by the community. There are categories for single, married, friendship, family, dating, & couples. Topics on body image and sexual health. Something for everyone. So if you haven't stopped by, or just haven't stopped by lately, head over and see what's going on at Eden Cafe!